Good table manners are a courtesy to the people at the table…This is how you show respect to your family and your friends. True, true, unless you are going to be a hermit, you have to know that people do not want to see the food in your mouth or hear your processing of it. You want people to remember the food and your good company and not the distractions you may have caused. On the other hand, we all need to allow for a genuine mistake or accident. Being offended by these is more rude than putting a spoon on the wrong plate. 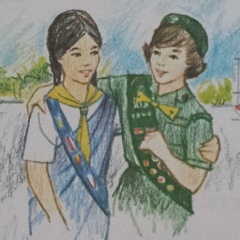 Junior Girl Scout Handbook. New York: Girl Scouts of the United States of America, 1963. 151. Print.